You're probably familiar with the heart icon as a shortcut for favoriting. It means the same on GovTribe. This button appears on every NAICS Category, PSC Category, Agency, Vendor, Person, Vehicle, and Grant Program page on the site. Use the Favorite button to indicate preferred NAICS codes, target Agencies, any contracting vehicles you are on, or any contracting officers that you work with. Favoriting something on GovTribe serves a few purposes. Firstly, it makes the favorited item easily accessible if you need to return to it often. Each of the search pages linked above have a Favorites tab to the right of the Search results tab. Click on the Favorites tab to see a list of your favorited items. The most useful aspect of Favorites, is that once something is favorited you are able to quickly add it to your filters when conducting any search. 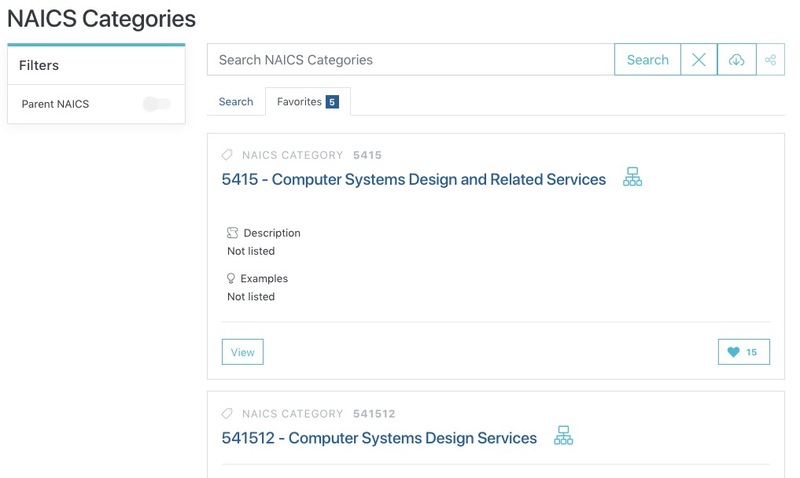 For example, if you go to NAICS Category search, find and favorite your company's NAICS codes, you can then apply those favorites when doing Federal Contract Opportunity search. 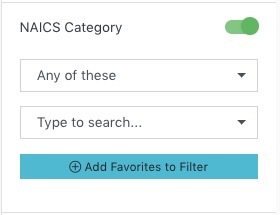 If you open up the NAICS Category filter in the filters menu on the left, you'll see a button that invites you to Add Favorites to Filter. With one click, all of your NAICS codes will be added to the search. Repeat the favoriting process with your PSC codes, client Agencies, Vehicles, etc. and it will make ad-hoc searching on GovTribe faster and easier.